Trial flights are really trial flying lessons. They are an opportunity for anyone to see what learning to fly is all about and at the same time have a fun experience. Instructors at Kemble Flying Club, in addition to normal flying training, have shared the thrill of trial flights with more than two thousand people since we were established in 1995. We offer a range of trial flights to suit all requirements. 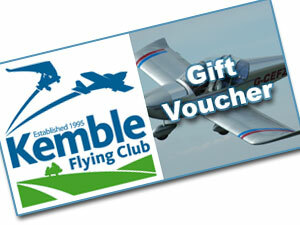 You can request a trial flight for yourself (above) or purchase a gift voucher for someone else. What is a trial flight? A trial flight, or air experience flight, can to a degree be what YOU want it to be. If you simply want to get your feet off the ground and have the pleasure of seeing stunning Cotswold views that is fine but all flying with us takes the form of a lesson in which you participate! How much actual ‘hands on the controls’ experience you have is entirely a matter for you and the instructor. Whether you have a standard trial flight or an extended trial flight, you can officially count these flights as the first contribution to training for your own flying licence. After showing you around and completing a Club form we will take you on a pre-flight safety brief. The pre flight brief will depend on any previous experience you may have and will be tailored to suit. After getting into the aircraft we have to make contact with the Control Tower and will taxi for take off. Departure from the runway is really quite exhilarating as our aircraft accelerate and climb quickly. If you are a little nervous don’t worry – the instructor will have already worked that out! The flights will vary according to circumstance, where the weather is coming in from, how high the clouds are and what you want, where you want to go. If you have a particular desire to fly somewhere in the Cotswold area please let us know. Soon we will have a map on our website that will indicate where we can fly in a given time. What aircraft will we fly in? The flight will be in one of our modern club aircraft. You can choose which type. If you aren’t aware of the particular differences between 3-axis and flexwing microlights we suggest you have a look at the British Microlight Aircraft Association web site. If you are buying the trial flight as a gift for another person, they can choose which aircraft they’d prefer to fly in when they book the flight. The standard 30 minute flight costs £86 and you will be with us for an hour to complete everything. The extended trial flying lesson is for one hour flying and costs £160. For this lesson you will need to allow two hours total time. For those of you who seek a little more to really see if flying is going to appeal, the Half Day Course at £286 combines a Standard Trail Flight (30 mins) and a full flying lesson with additional detailed introduction to microlight training and covering exercises 1 – 6 of the BMAA Syllabus thoroughly. Includes Temporary Club membership. This is another option which we can tailor to suite. There are more details on the Prices / Costs page but the total is £560.00. Gift vouchers are available by filling in the form here, and you can pay here on line too, it is very simple. You will get a confirmation your order is in our admin in tray and a confirmation when your Gift Voucher has been despatched. If it’s really urgent then use the same system but please call 01285 770077 to request a same day posting. If you wish we can even email a Voucher for you to print straight away. Remember that the voucher is valid for 12 months but do encourage the recipient to book their flight asap. Any time of year is good though of course we have many more postponed flights in the Winter. We have to fly all flights within the validity period to ensure there is no backlog and for good accounting but unlike most voucher sales companies we will still honour a voucher that has expired. It is rarely a problem but to encourage all flights to be flown within the validity period we now charge a re-validation fee of £25. You can request a trial flight by filling in the form here or simply call 01285 770077. We book the flight on our online system. We will need to know which type of aircraft you wish to fly in at this stage. Come the day, or even the day before, you can call us to check the weather. We want you to enjoy the flying experience and we will not expect you to have to endure flying in poor weather conditions just so we get the flight done. NB: The office is not manned all the time but if you leave a message including a contact telephone number we will get back to you normally the same day. All messages are forwarded immediately to the Chief Flying Instructors mobile telephone. Normal clothes for the time of year and you may like to have sunglasses. For the flexwing aircraft the school will provide you with a flying suit, gloves, helmet and headset to use during the flight. Please wear comfortable clothes and practical footwear. For summer flights, please bring a sweatshirt or pullover. For winter flights, dress warmly in layers and consider wearing thermal socks! Any further queries, please call us! If you would like to take a camera with you on a Trial Flight that is no problem at all in the three axis aircraft but there are safety issues with cameras in the open cockpit flexwing aircraft due to the risk of dropping the camera overboard! Do discuss with us what is possible before the flight. The minimum age for taking flying lessons is 14. We will always consider taking enthusiastic youngsters for a flight as a passenger. Disabled people can fly in microlights, provided you can be seated in comfort and safety in the aircraft. Please discuss with us. Nominal weight limit is 105 kilos. If you are over this weight please telephone and discuss with an instructor so we can ensure the weight limit on a particular aircraft will not be breached. Family and friends are welcome to join you – we have a nice pilot lounge and a picnic area immediately outside the Club and there is the AV8 airfield restaurant just 120m away.